Grassroots limited government constitutional conservative voters who thought that the Republican establishment would change its Big Government ways after the 2014 midterm election got a big shock last night – Speaker Boehner and his House Republican leadership team allied themselves with President Obama to pass the hated “CRomnibus” spending plan 219 to 206. That’s the bad news – the good news is that we conservatives now have a list of targets for the 2016 Republican primary elections – starting with House Rules Committee Chairman Pete Sessions of Texas, truth-challenged House Appropriations Committee Chairman Hal Rogers of Kentucky and House Majority Whip Steve Scalise of Louisiana. The “CRomnibus” gives our Social Security to illegal aliens. The “CRomnibus” returns to the legalized bribery of earmarks that Republicans promised to abandon years ago. The “CRomnibus” further busts the spending caps that Republicans already broke in the Ryan – Murray budget deal. The “CRomnibus” funds Obama’s war on farmers and energy producers by giving $250 million more than Obama requested to the Environmental Protection Agency. The “CRomnibus” gives $4 million to the Department of Justice to process the amnesty applications of illegal aliens. The “CRomnibus” gives millions of dollars for job training and education grants to train illegal aliens to compete with American workers for jobs. If anyone of these policies had come before Congress as a standalone bill the voters of this District would have melted the phone lines in opposition to it. Why would Rep. (name here) vote for a bill that contains all of these destructive policies, and more? Based on (his/her) vote in favor of the “CRomnibus,” the limited government constitutional conservative voters of our District should begin looking for a candidate to oppose Rep. (name here) in the 2016 Republican primary election – someone who will actually vote the principles Rep. (name here) deceived us into thinking (he/she) stands for. That the “CRomnibus” garnered 162 Republican votes proves once again the truth and wisdom of ConservativeHQ.com Chairman Richard Viguerie’s dictum that the greatest impediment to conservative governance is not the liberal Democrats, but the Big Government establishment Republicans like Speaker John Boehner, Majority Whip Steve Scalise, Majority Leader Kevin McCarthy, House Appropriations Committee Chairman Hal Rogers and House Rules Committee Chairman Pete Sessions. Click this link to go to the roll call on the "CRomnibus" to see if your Representative abandoned conservative principles and voted for the "CRomnibus." Submitted by chaslie on Mon, 12/15/2014 - 14:37. All I can say is if the Republican Party continues down this road by 2016 I will no longer be voting Republican because I am tired of a party that turns around and stabs you in the back. I will be voting strictly for 3rd Party candidates. Submitted by Joseph C Moore-... on Fri, 12/12/2014 - 13:49. The new congress of the people of our Republic should not be hampered by such as the continuing resolution just passed by the seditionists of the present congress. This is egregiousness in going against the vote of the electorate and the perjurious oath of office taken by the politicians who had no intention of fealty to their SWORN ON A BIBLE oath to the Constitution of our Republic. Submitted by sdofaz on Thu, 12/18/2014 - 19:43. 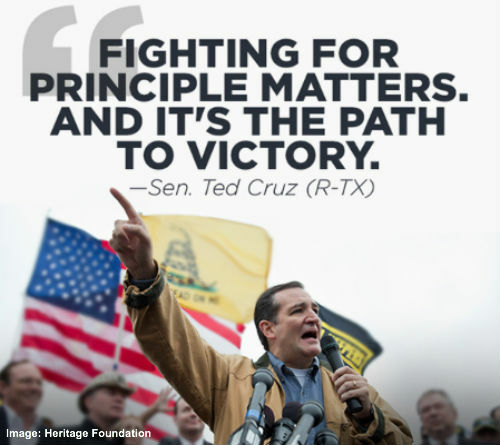 Cruz is definitely shining the light on all of the things done in the dark by this current batch of elected officials including the new ones. Actions do have to follow words otherwise their words are just lies. Surprised by any of this BAU and Pork Barrel in Congress anyone? It is time for a recall and for some serious challengers to the current two party system. It is obviously too bloated with corruption to function correctly. Looks like the BAU is going to continue without a pause. GOP and Dems are all showing their true colors and intentions. So, let's talk about some serious alternatives. Can anyone explain what a recall action for senators involves? I would be exceeding interested in that first. Then what about another party getting started? This needs to be moving soon if the 2016 elections are going to be anything but another BAU dynasty event. You know, one of the Bushes, or a Clinton or the other good old boy big business candidates.